The highlight of Sarah Palin's career? It's not her guest spot on SNL, or her scary stump speeches in front of screaming crazy racists. It's this cover for the upcoming Tales From the Crypt comic. Sporting a hockey stick—and heaving breasts reminiscent of the comic's golden days—she asks the fleeing ghouls, "Didn't we get rid of you guts in the 50's?" 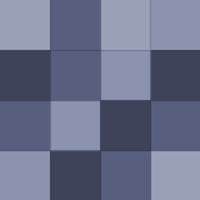 It's a reference to Palin's book-banning ways, as well as to the wave of censorship that forced Crypt's original publisher to shut it down in 1955. [A]ccording to Jim Salicrup, editor-in-chief of Papercutz, the publisher that revived the classic title about 16 months ago. "This was not a partisan thing. People tend to think of everything as black and white these days—you are either for or against one of the parties 100%. 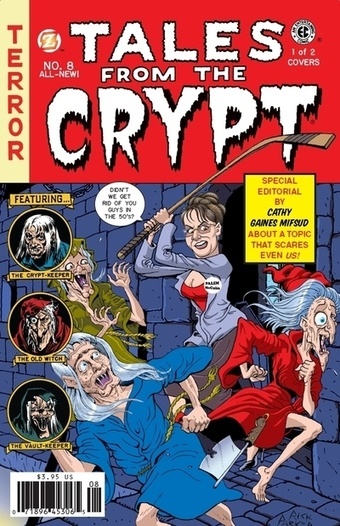 But for us this was about the history of EC Comics, the original publisher of 'Tales from the Crypt.' Anyone who knows that history knows that even of whiff of banning books is going to get us angry."